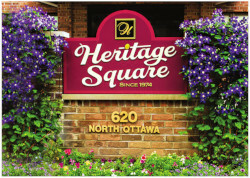 Welcome to Heritage Square, an oasis in senior living! Our gorgeous campus in historic Dixon, Ill. offers a continuum of care from independent housing to a skilled nursing unit staffed by an excellent ratio of medical personnel that tend to our residents around the clock. The Illinois Department of Public Health has bestowed upon us a 5-star rating, which we are very proud of. 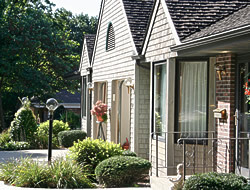 Ever since we opened our doors in 1974, Heritage Square has established its reputation as a progressive model in senior housing and health care. As a not-for-profit corporation, we can provide truly unique services to our residents: While we can keep our rates affordable, our staff has been freed up to focus on one mission – providing the highest quality of care in a warm and loving environment. At Heritage Square, we celebrate life. Paintings by local artists line the walls, and community gardens bloom outside the windows. Residents can maintain the normalcy of their lives, while participating in a wide range of activities offered for their social, cultural, and personal enrichment. Our residents are empowered – through an elected Resident Council of peers – to decide how best to improve their experience here, from recipes and meals to the new community vehicle. 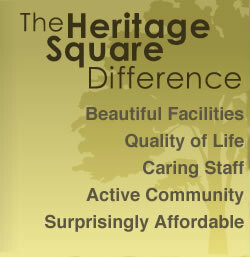 Heritage Square operates as a community unto itself, with every amenity just steps away. To visit the doctor, residents simply walk down the hall to the examination room. For a hair cut, they open the door to the beauty salon. For a physical therapy session or to vote in an Election, residents do not need to leave the premises; for the convenience of our residents, Heritage Square is equipped with a state-of-the-art rehabilitation room, and residents are able to vote on our campus. Established by two like-minded community leaders in 1974, Heritage Square continues to achieve the original ideals of its founding. Because of our high standards, the Dixon community supports and reveres Heritage Square, with our generous donors enabling us to continue enhancing the quality of life for our residents. 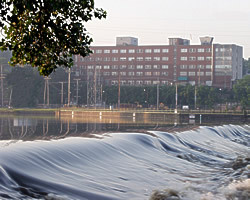 Heritage Square is located in Dixon, Ill. – the hometown of President Ronald Reagan – and sits just a few blocks from the Rock River and the downtown district. Residents can walk to shops and restaurants, and watch the seasons change in a quaint, safe town in the heart of the Midwest.